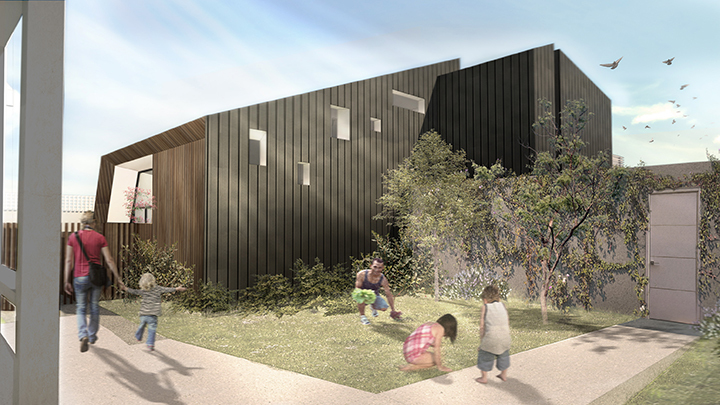 Taking reference from surrounding context, the pitched roof form reduced the visual bulk and overshadowing to adjacent dwellings, as well as integrating neighbouring characters into the design. Sitting near the corner of Murray and Gilbert Roads local centre, this dual occupancy site at St. Duthus Street is a good take on small scale urban intensification in suburban Melbourne. This project celebrates sustainable living and the notion of 20-minutes city, with public transports, amenities, and services within close proximity, this dual occupancy offer a convenient and less car-dependent lifestyle. 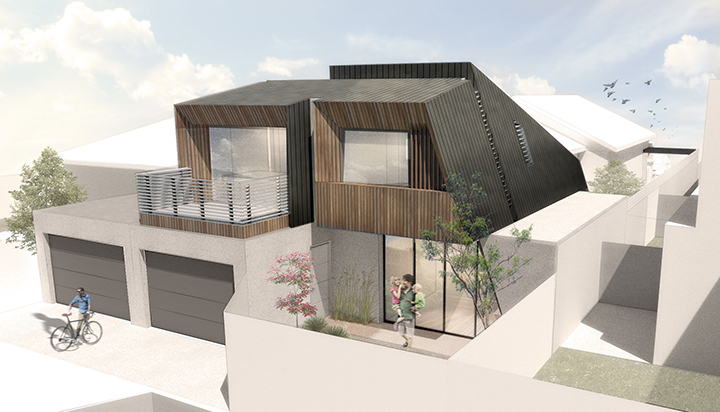 The dwelling has been sited to be visible from the street to provide a sense of address and legibility. This sense of address has been enhanced by relocating vehicular access from the front of the property to the rear via the rear R.O.W. 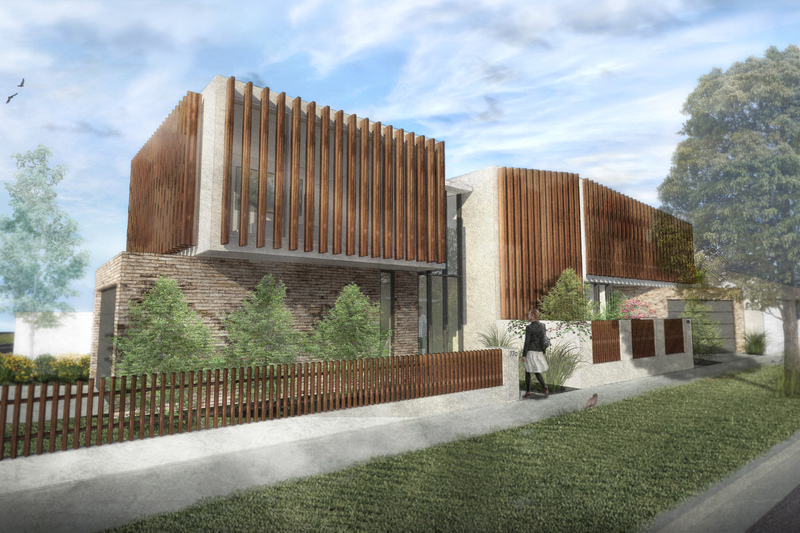 The dwelling is sited to maximise the opportunity for private open space and provide flexibility in terms of access to sunlight and shade at different times of the day and season. These spaces are also used to provide buffer to the existing dwelling on site. The roof of the dwelling is pitched towards the north and south sides to reduce the physical presence and visual bulk of the dwelling. The southern side closely aligns with the existing dwelling scale and creates an internal ceiling profile that follows the line of stair. 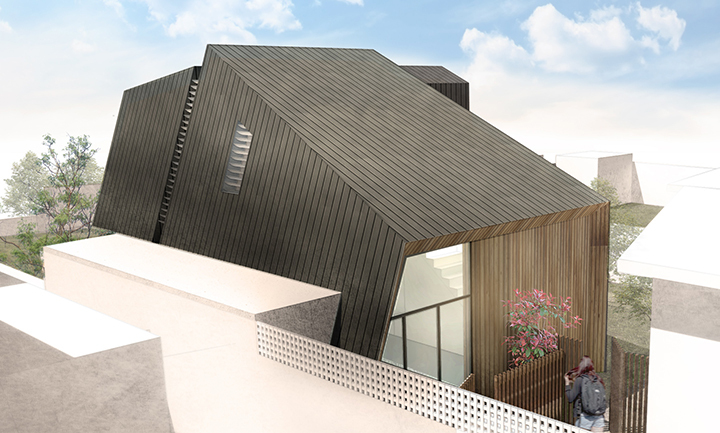 The pitched roof also references the pitched roofs in the area to better integrate with the existing streetscape. 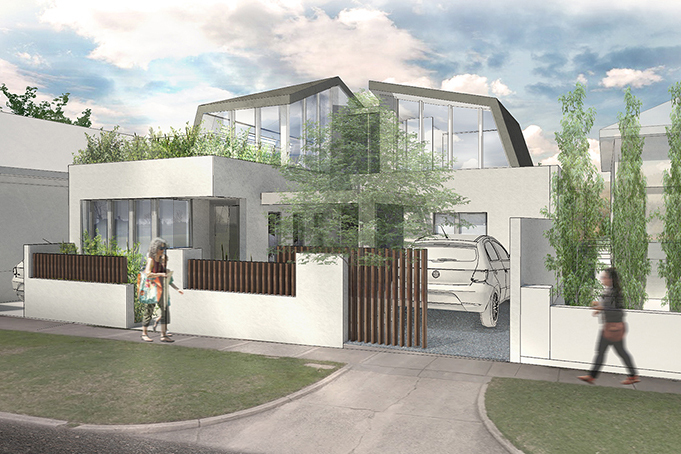 The upper level of the dwelling is setback from the boundary to give ample space to the neighbouring dwelling. The wall is further pitched at an angle to maximise usable space to the upper bedrooms while minimising both visual bulk and overshadowing. the generous entry and window positions have been expressed as recessive elements to soften the massing of the dwelling. This articulation is further reinforced by a change in materiality to form a building that is composed of distinct but cohesive segments. The internal ceiling line is pitched up towards the entry to create a welcoming sense of arrival and a clear designation of "Entry" as perceived from the street. This is reinforced by the uninterrupted views from the front door through to the courtyard adjacent to the living area.